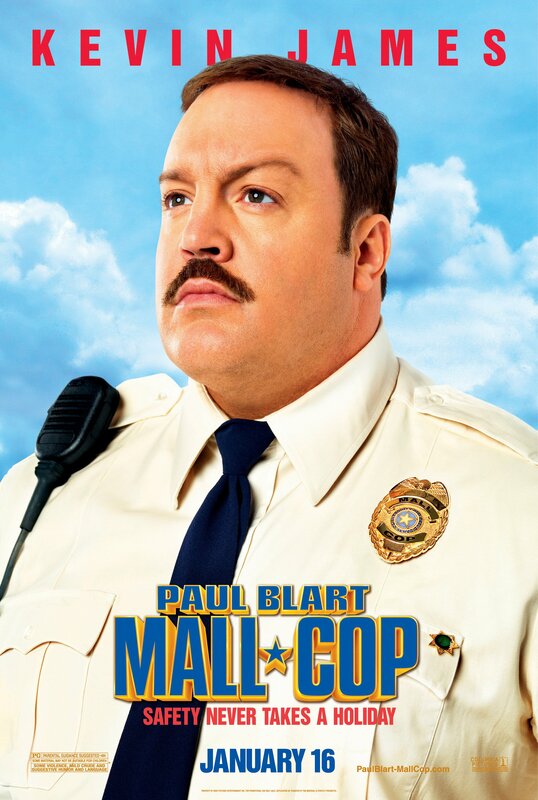 I expected Paul Blart: Mall Cop, a comedy starring Kevin James and backed by Adam Sandler’s production company, to fall towards the Razzies end of the movie spectrum. At a glance, it looks like a collection of throwaway gags about a portly mall security guard who does his rounds on a Segway. Instead, the movie is a warm if not always funny portrait of a portly mall security guard who does his rounds on a Segway. James plays the eponymous mall cop who aspires to join the state police. He has the mental acuity and physical ability to be a part of the force but is stopped by his hypoglycemia, as in it literally causes him to pass out just as he reaches the finish line of the exam. His optimism and devotion to his current job tides him over though, and he is especially encouraged when he notices Amy (Jayma Mays), a new salesperson at the wigs kiosk. His efforts to win her over along with his training of a new guard (Keir O’Donnell) are interrupted, however, when a gang stages a robbery and takes hostages, putting Paul’s skills to the test. That switch from a charming romance to an action comedy is not as jarring as the realization that the movie is actually quite sweet, a departure from the cruder films in the Sandler orbit and the unfulfilled man-child vehicles of comedians like Seth Rogen and Jonah Hill. Paul Blart, both film and character, never resort to shock or an appeal to baser instincts for laughs, and the movie is, in truth, a mild and wholesome family comedy. Paul is a single father of a teenage daughter and lives with his mother. He cuts a somewhat pathetic figure, someone who gets close to his goals without ever really achieving them. But James is very likable and makes his character easy to root for, whether he’s being humiliated by a love rival or displaying his mall cop heroics in the third act. Raini Rodriguez plays his devoted daughter and wills the audience into loving her father or at the very least caring for him. The movie is not as successful generating laughs, though a shift towards a younger target audience would do the trick. The jokes fall under three general categories: James’s rotund figure, his impressive Segway skills, and mall security. The faux seriousness of the latter underpins the film and is done in a way that keeps things from becoming too cynical. Again, perfect for a family night in. Besides James, Mays also adds to the upbeat tone, but she doesn’t do much beyond her role as idealized love interest. Bobby Cannavale chews some scenes too as Paul’s sneering former classmate and bully turned state cop. Posted in USA, Western movie reviews and tagged comedy, family films, Jayma Mays, Kevin James, romantic comedy on March 6, 2016 by limmer13.